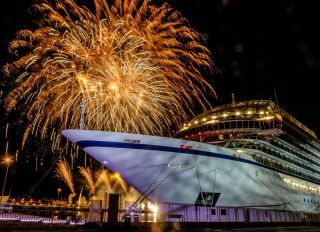 The official naming ceremony of the Viking Orion took place on June 14 in Livorno, Italy. Throughout history, humans have shared an innate interest in exploration — to travel to new reaches of our planet, and even our universe. Last month, I sailed with the Viking Orion for its maiden voyage in the Mediterranean. Traveling to new places served as a reminder of the deeply curious human nature that continues to inspire space exploration. Among the many guests on board were dozens of Fisher's friends, family and fellow astronauts, which offered a unique opportunity to meet some of the experts who worked on the space shuttle or the space station, as well as those working on Orion. A group of 15 NASA astronauts share their favorite experiences in space and talk about what's next for space travel during a panel called "Explorations in Space: A Conversation" on June 16. Regarding future space travel, the ship's name alone serves as a reminder of our continued space exploration. The Orion spacecraft is scheduled to launch its first uncrewed Exploration Mission 1 (EM-1) by the end of 2019. During that mission, the Orion capsule will loop around the moon and come back to Earth. NASA has also started working on Exploration Mission 2 (EM-2) — the spacecraft for the second Orion flight, which will be Orion's first crewed mission around the moon. If everything goes according to plan, EM-2 will send humans on a loop around the moon that will take them farther than people have ever traveled into space — 40,000 miles (64,000 kilometers) past the moon. NASA also hopes to use the Orion vehicle to carry astronauts to other locations in the solar system, such as an asteroid or Mars. During a panel called "Explorations in Space: A Conversation" on June 16, a group of 15 NASA astronauts shared their favorite experiences in space and talked about what's next for space travel, including the goals of the Orion capsule. It was during this panel that NASA astronaut Drew Feustel called the cruise ship from the space station. This marked the first time that the orbiting lab has contacted a nonmilitary vessel, and was without doubt one of the coolest experiences of my life. The Viking Orion disembarked from Rome on June 13. The first port of call was Livorno, which is a gateway to Tuscany, a region reached by the original Viking explorers. Also nearby is Pisa, which is known for its native Galileo Galilei, whose work contributed to our understanding of the laws of motion and who invented the Galilean telescope, which has helped advance our understanding of the world and universe. Because of this connection to science and exploration, Livorno was chosen specifically for the ship's naming ceremony, Viking representatives said. The first port of call was Livorno, Italy. A short ride inland brought us to the Leaning Tower of Pisa, where in 1589, Italian scientist Galileo Galilei experimented with gravity. The ship was positioned alongside the city's historic Old Fortress (Fortezza Vecchia), where in 1622 students of Galileo held an experiment to test his projectile motion theory. In honor of Viking Orion's naming ceremony, Viking offered a special interactive exhibit inside the Fortezza Vecchia. From the Vikings' solar compass to Galileo's gravitational and projectile motion experiments, the exhibit told the stories of exploration technology throughout history. While in Livorno, I had the opportunity to visit the Leaning Tower of Pisa for the first time. In 1589, Galileo experimented with gravity by dropping objects from the tower. Those objects ranged from cannon balls to musket balls, gold, silver and wood. The overall theme of the Viking Orion pays tribute to Nordic mythology and the spirit of science and exploration. Sailing with the Viking Orion highlighted the similarities between our innate human interest to travel not only to new places on Earth, but to also explore the universe around us. Yet another way that Viking Orion encourages passengers to embrace the adventures of space is in the ship's explorer dome — a new high-tech planetarium located on the second level of the ship's Explorers' Lounge. The attraction offers shows about space and exploration, including one segment that details NASA's new Orion spacecraft. While on the ship, I was treated to special showing of one of the films called "Journey to Space." Stars, planets, constellations and galaxies were projected overhead in 3D. The presentation detailed mankind's desire for exploration, from the Vikings, who used the stars to sail uncharted waters, to the Apollo 11 landing on the moon. Viking hopes that this new attraction, which is unique to Viking Orion, will inspire viewers to look to the stars through the eyes of early navigators. The Explorers' Dome will also offer at least one other 3D film, called "Under the Arctic Sky," for the remainder of the ship's 2018 maiden season. The Explorers' Dome onboard the Viking Orion is currently the highest-definition 7K planetarium in the world, and is only the second cruise ship in the world to have a planetarium on board. In addition to the Explorers' Dome, the ship has a Viking Resident Astronomer, who will lead lectures on the wonders of the cosmos and offer guided tours of the night sky during stargazing sessions. Viking's portable telescope can be hooked up to the planetarium so passengers can see the night sky from their seats inside the dome. My trip on the Viking Orion cruise ship ended in Marseille, France, on June 17. It was a wonderful experience to learn more about history, space and the sea while traveling to beautiful locations in the Mediterranean. Taking a space vacation like this was truly a privilege and something that I hope more people have the chance to experience. Editor's note: Samantha Mathewson joined this space cruise on an invitation from Viking as part of an unpaid media preview event for Viking Orion. Read more about her journey here.